As we start a new Rotary Fiscal Year, my first thoughts are to thank all of you, ROTARIANS from our Morrisville-Yardley Rotary Club, for depositing your trust by electing me to preside over our activities for the 2013-2014 period. Many, if not all of you, have occupied this position in the past, I must tell you that I am very honored and humbled by the responsibility you have placed on my shoulders. The work and effort that all of you put into our Club over many years, has resulted in making it a very respected organization in our community. The continuing success of our Club will depend on a team effort. All of us will be called to actively participate in our activities and projects, and we can begin by increasing attendance to our Club meetings, and help make each one of these meetings an enjoyable occasion of friendship and camaraderie. 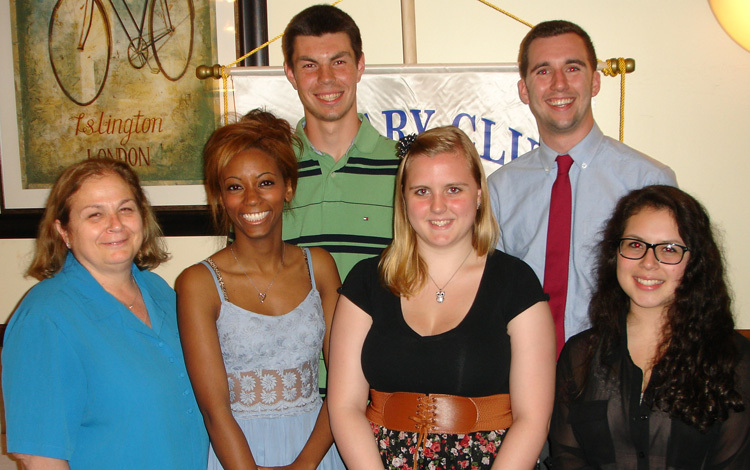 - The incorporation of at least 3 new ROTARIANS, while retaining our present 24 Rotarians. - Contribute $5,000 to the Rotary Foundation. I propose to do this through $3,000 from donations from 3 Paul Harris Fellows, and an additional donation of $ 2,000 which can be obtained from the $2 contribution that we make, every week, by attending the Club meetings. - Contribute at least $600, but preferably $1,000 to the Polio Eradication Campaign. Planting a Vegetable and Beautification Garden for the Grand View Elementary School in Morrisville. The Delaware Canal Towpath and Landmark Towns Sign Project for Yardley and Morrisville. The third phase of the club’s Water Filter Project in Lima, Peru. If by May, 2014, we are able to attain these goals, then we can apply for a Rotary Presidential Citation for the Club. These goals can only be reached if we get the full cooperation from all of you, in our traditional fund- raising projects, re-activating and continuing activities such as the Four Way Test competition, the distribution of dictionaries to students at an elementary school in Morrisville, the Annual Morrisville Community Easter Egg Hunt, Sponsorships for Camp Neidig, Morrisville HS Community Service Scholarship, the YMCA Reading Project, etc., all of which, will result in further enhancement of our public image and awareness. The Water Filter Project in Peru will give us the opportunity to strengthen our ties with other Rotary Clubs in District 7430 and with the Lima Sunrise Rotary Club while continuing our focus on humanitarian service in this international project. "WHEN WE PUT SERVICE ABOVE SELF WE ARE MAKING A CHOICE. WE ARE CHOOSING TO PUT OTHER PEOPLE'S NEEDS AHEAD OF OUR OWN DESIRES. WE ARE SAYING "YOUR PROBLEMS ARE MY PROBLEMS AND I CARE ENOUGH TO HELP YOU." A mirror and a window are both made of glass: One shows you yourself, the other shows you the world. Let God give you His perspective on the difference. 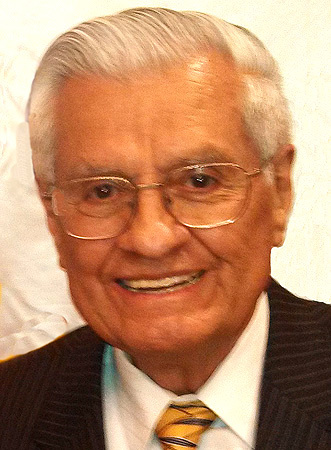 Juan Proano was sworn in as the new President of the Morrisville-Yardley Area Rotary Club for the Rotary year of July 2013 through June 2014. Outgoing President Michele Fina presented him with the President’s gavel at the recent “Changing of the Gavel” party at Juan’s home. Michele is the Director of the Morrisville YMCA and Juan is a mining engineer and mining executive from Peru. In his acceptance remarks Juan identified the three major service project goals of the club and challenged to all Rotarians in the club actively support these projects and the vital fund-raising projects and traditional projects and activities of the club. These efforts, he said, enhance the public image of the club and contribute to community support and provide the basis for the camaraderie among Rotarians and their friends. He asked for all Committee Chairpersons as well as new Board Members to come forward and be recognized as the key leadership team of the club. Speaker of the occasion was Larry Kidder, Professor of History at the Hun School in Princeton, NJ, and a researcher at the David Library. He talked about the early military career of James Monroe, the 5th President of the United States, and his role in the American Revolution and especially the Battle of Trenton. Monroe became a lieutenant in the Continental Army and by 1776 had joined General Washington in New York. After the Crossing, Lt. Monroe was assigned as second in command to one of the advance parties moving on Trenton, led Captain William Washington, a distant cousin of General Washington. As they marched toward Trenton, a Jersey man came out to see why his dogs were barking. He thought the soldiers were British and ordered them away. Monroe told him to go back to his home or be taken prisoner and when the man realized that they were American troops, he brought them food and offered to join them. He explained that he was a doctor and might be able to help. During the battle of Trenton Captain Washington was severely wounded in both hands and Lt. Monroe took over. Monroe too was wounded by a musket ball but was saved from bleeding to death by the same doctor, Dr. Riker, who went on to distinguish himself in service to the new country. 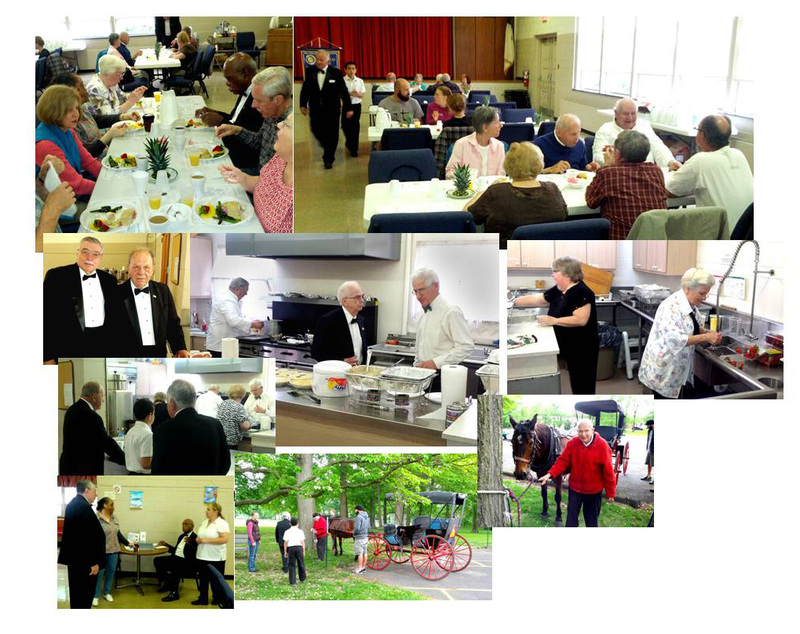 The club wants to extend its appreciation for the community support it received of its recent fund raisers, the Morrisville Carnival in Williamson Park and the Gourmet Breakfast held at the Morrisville United Methodist Church. Profits help support community projects including the annual Morrisville High School Community Service Scholarship, Camp Neidig Youth Leadership Scholarships, Buck Up for Bucks and Rotary’s Annual Community Easter Egg Hunt, as well as the club’s involvement in providing water filters to impoverished areas around Lima, Peru, supporting Rotaplast which provides free corrective surgeries for cleft lip and palates to children in remote parts of the world, and Rotary’s international effort to eradicate polio from the face of the earth. Local projects in the works include the Vegetable and Beautification Garden Project at Grandview Elementary School in Morrisville and the Yardley-Morrisville Delaware Canal Towpath and Landmark Towns Sign Project. Local Rotarians and friends continue to volunteer at the Trenton Area Soup Kitchen. Anyone interested in these or other Rotary projects is invited to contact the club through the “Contact Us” page on the club’s website. At the recent Morrisville High School Awards Evening, Nicholas Castillo, Juliana Manning and Kevin Munoz were recognized as recipients of the club’s Camp Neidig Youth Leadership Scholarships and Kevin was awarded Rotary’s $500 Community Service Scholarship. 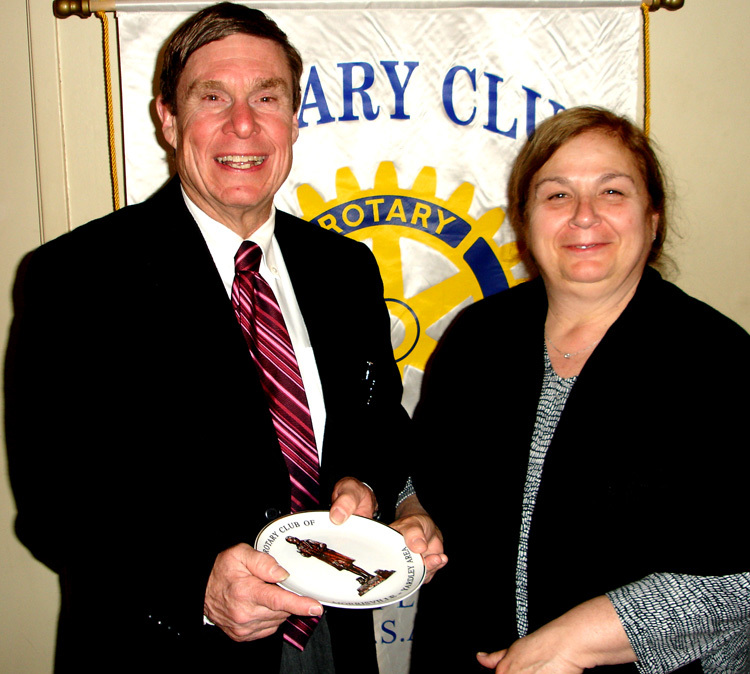 The awards were presented by Rotarian and teacher Linda Yonkin. 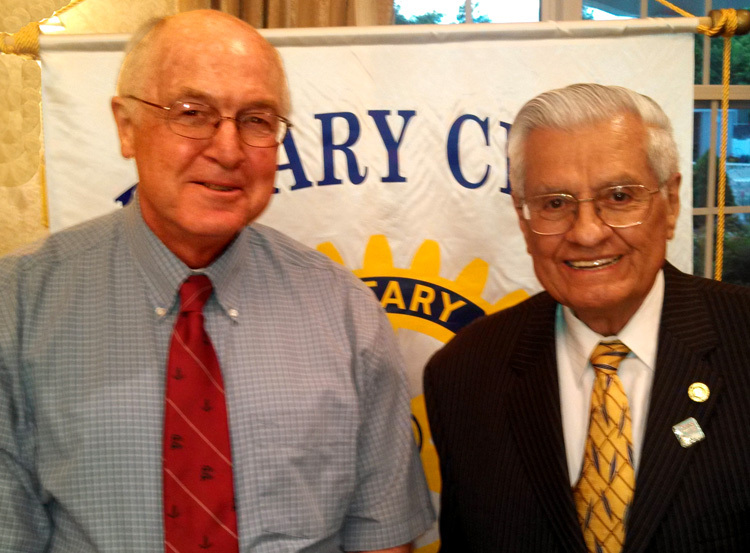 Rotarian Ted Fletcher previewed the upcoming “Revolutionary Weekend”, scheduled for later in the year. Ted described the bus tour that will be similar to last year’s very interesting and informative tour. Barry Johnston, Quality Resources Coordinator of BARC Developmental Services, explained the mission and history of the organization. BARC is a non-profit organization under the management of a volunteer Board of Directors dedicated to serve and be an advocate for people with intellectual disabilities and Autism. It serves people in Bucks County through its three main services, Residential, Vocational and Early Intervention. Residential Services include intermediate care facilities, community living arrangements, supported living arrangements and life sharing. Vocational Services include industrial employment-training, disabled seniors retirement support, adult training for those not ready for work in a production setting and Autism Spectrum Disorder programs. Early Intervention Services are designed to help families with children with intellectual disabilities and Autism. BARC developed from an effort in 1951 by parents who were struggling because of no educational services in Pennsylvania for mentally retarded children. For more information got to www.barcprograms.net. 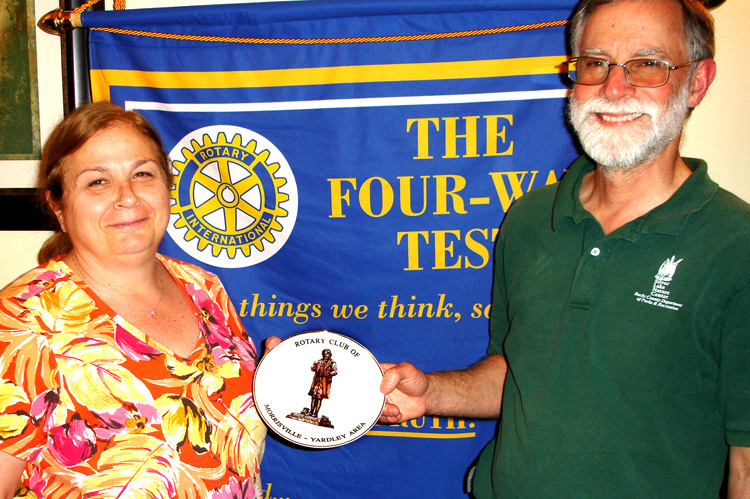 Club President Michele Fina presented Barry a Robert Morris commemorative plate as a token of appreciation for his talk. Bob Mercer, Director and Naturalist of the Silver Lake Nature Center in Bristol, talked about the many opportunities right in our backyard to explore and enjoy nature. There are many planned activities for children and 4.5 miles of trails for all to enjoy. Silver Lake originated in 1689 as a mill pond to provide power for the mills in Bristol. It now is a 235-acre “natural treasure” that includes lush foliage, accessible wetlands and rich woodlands. Much more information can be found at www.silverlakenaturecenter.org. Erica Armour, Director of Historic Fallsington, talked about the efforts to preserve and share the 300 year-year old village of Fallingston where William Penn once worshiped. There are over 90 historic buildings in the village spanning the 17th, 18th and 19th centuries. Early on it was a significant religious, social and market center for the surrounding community. In spite of overwhelming development pressures in recent years, Historic Fallsington has been able to preserve six historic buildings. It also provides educational programs for school children, support for Cub Scout, Boy Scout and Girl Scout organizations and lectures and workshops for adults. It also sponsors the annual Fallsington Day fair and hosts other social and educational events during the year. For more information call 215-295-6567. 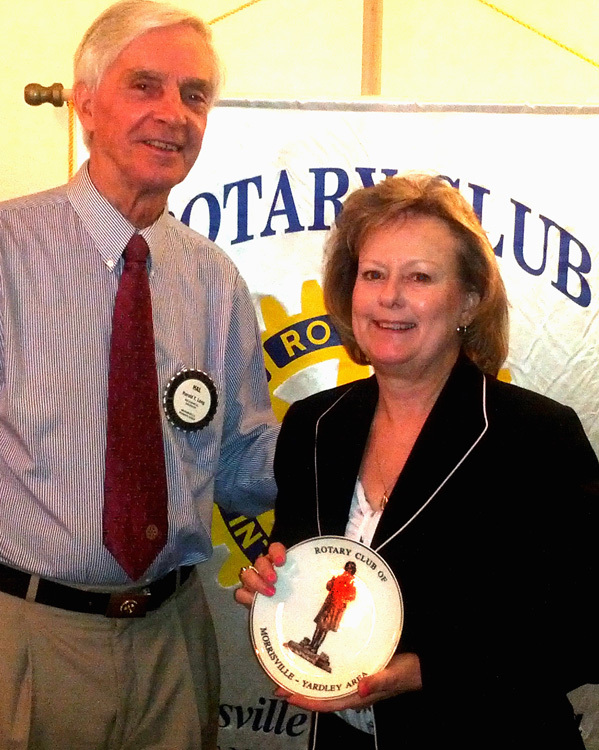 Erica was presented a Robert Morris commemorative plate by Rotarian Hal Long in appreciation of her talk to the club. Drew Gould, Principal of Gould Environmental in Morrisville, talked about Environmental Site Assessments and the process of Due Diligence. Assessments are of importance to prospective purchasers of commercial property, contiguous property owners and landowners who need to understand whether or not there are environmental contaminations and conditions that constitute hazards or business risk. Storage of hazardous substances, identification of wells and septic systems, existence of wetlands, identification of any asbestos-containing material, the existence of lead-based paint and issues of radon and mold are some of the environmental factors that may be evaluated. Evaluation is done by means of examining records, interviewing people and site reconnaissance and testing. Gould Environmental may be contacted at 215-295-2400. 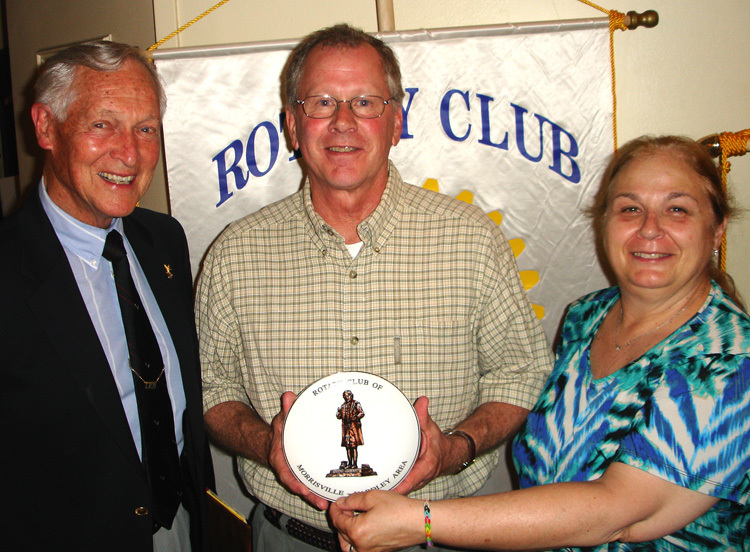 Program Chairman Andy Thompson and Club President Michele Final presented a Robert Morris commemorative plate to Drew (center) in appreciation of his talk. Rotarian Andy Thompson led Camp Neidig alumni panel discussion about the experience and the benefits of attending the Camp Neidig Youth Leadership Weekend Training program (a Rotary District 7430 project). Panelists Nicholas Castillo and Michael Leather (back row left to right) and Arie Berry-Johnson (front, second from left) attested to the value of the experience, from learning more about themselves to assessment of leadership approaches to the formation of lasting friendships. In attendance were two Morrisville High School candidates for this year’s Camp Neidig: Jessica Worrell and Brittany Ramirez (front row, third and fourth from left). Club President Michele Fina (left) welcomed the group and thanked them for their participation. The program, about Mercer Street Friends in Trenton, was presented by Bill Heinemann (center right), Vice President of Syncro Technology in Langhorne and Chairman of the Board of Trustees of Mercer Street Friends and Alan Crosman (center left), Financial Advisor and retired Human Resource Director of Haveford College and Treasurer of Mercer Street Friends. 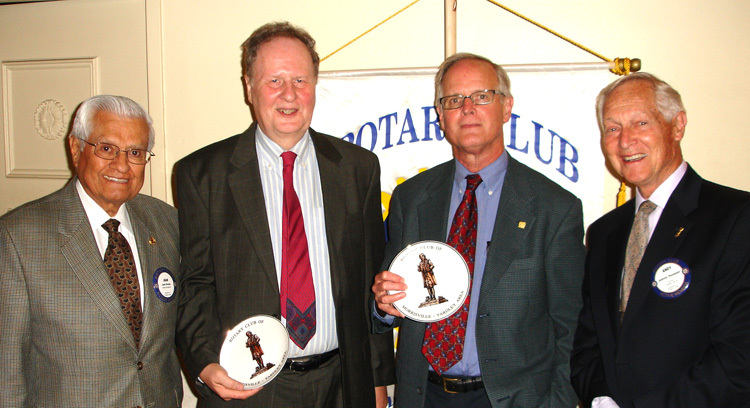 Club Vice President Juan Proano (left) and program Chairman Andy Thompson (right) presented to the speakers the Robert Morris commemorative plates in appreciation of their presentation to the club. 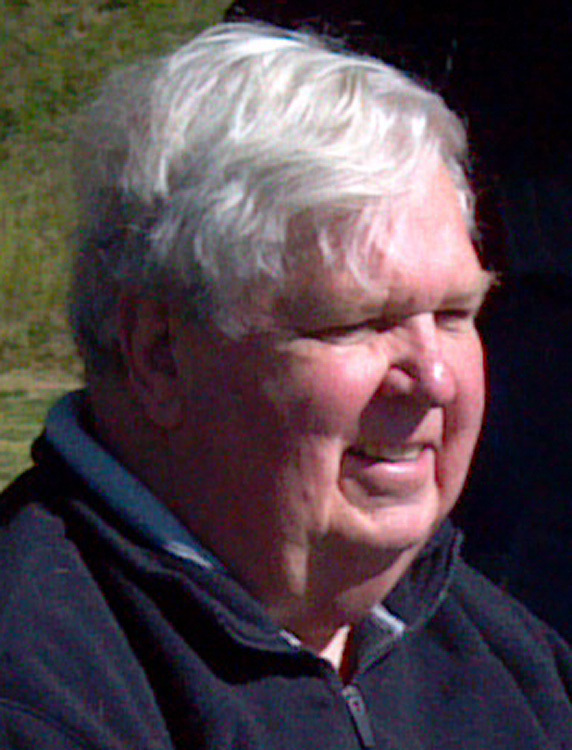 Bill Heinemann noted that several years ago he and his wife, Linda, who was a new faculty member at George School, were treated to a buggy ride around Trenton by Sam Snipes. Sam, now a member of the Morrisville-Yardley Area Rotary Club, had made it a tradition of taking the new faculty members on the buggy rides. One of the destinations was a former Friends meeting house at 151 Mercer Street in the Mill Hill section where Mercer Street Friends is now located. Mercer Street Friends is a Quaker-affiliated, nonsectarian human care organization that provides compassionate and practical solutions to the problems of poverty and health. It serves more than 20,000 people a year from seven locations and 11 program sites, including the historic original location in Mill Hill. Its programs serve infants, children, youth, parents and adults, and the disabled and elderly. It operates on a budget of over $10 million and has over 100 employees and more than 500 dedicated volunteers and has been in operation since 1958. The programs are funded by a combination of private donations, government funds, foundation grants and user fees. One of the higher profile activities, Bill said, is the Mercer Street Friends Food Bank, which has been leading the community response to hunger since 1987. The food bank supplies over 2.5 million pounds of food each year to more than 60 organizations in the area including the Trenton Area Soup Kitchen (TASK), the Morrisville Presbyterian Church Food Bank, Homefront, Crisis Ministry, and The Rescue Mission of Trenton, that feed over 25,000 people at risk for hunger. The “Send Hunger Packing” program provides 250 children with backpacks full of nutritious food to tide them over weekends and school breaks when they have no access to school breakfast and lunch programs and would otherwise go hungry. The outreach programs link food insecure individuals and families to the Supplemental Nutrition Assistance Program, summer feeding sites and other hunger prevention program and resources, and its nutritionist provides education on healthy eating with a particular focus on combating childhood obesity. Richard McClellan (center), Public Relations Director for the Delaware River Joint Toll Bridge Commission, explained that the bridge commission is a bistate, public agency charged with providing safe, dependable and efficient river crossings between Pennsylvania and New Jersey. It was established under legislation enacted in the two states in 1934. The federal Compact for the commission was first approved by Congress in 1935. The agency's jurisdiction stretches roughly 140 miles along the Delaware River, from the Philadelphia/Bucks County, Pa. boundary northward to the New Jersey/New York state line. It operates seven toll bridges and 13 toll-supported (free) bridges (two of which are pedestrian-only crossings). Revenues from the seven toll bridges subsidize the other bridges. The agency does not receive any state or federal tax revenues and relies solely on toll collections for its financing. Regarding the maintenance and repair of bridges, Richard emphasized the extent to which the commission works to engage the affected communities whenever major work has to be done. He cited community input that led the commission to close the Calhoun Street Bridge during the last major renovation rather than attempting to keep it open during high traffic times. That decision was preferred by the community and saved many dollars in daily closings and openings and greatly shortened the total project period. The biggest project in the history of the commission is the looming improvement of the Scudder Falls Bridge. It has a design load of 40,000 vehicles per day and currently it is accommodating some 58,800 per day. By 2030 the projection is a load of 77,500 per day. The width of the roadways, the number of lanes and the interchanges are functionally obsolete. The commission determined in 2009 that it would have to become a toll bridge inasmuch as the commission receives no revenues from gasoline taxes or other subsidies from either state or federal resources. The planning and design process continues. 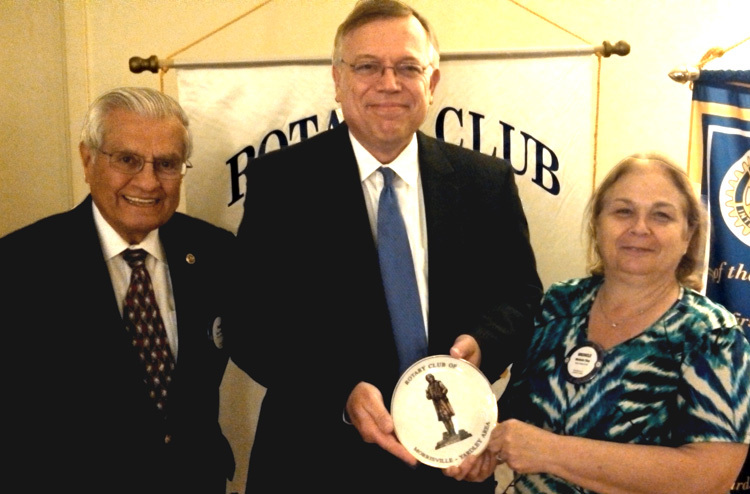 Club Vice President Juan Proano and President Michele Fina presented a Robert Morris commemorative plate to Richard in appreciation of his talk to the club.